As a Chinese American, who grew up eating nothing but Chinese food, lived in Hong Kong for 4 months and currently lives 20 minutes to Monterey Park, CA where I can frequent Taiwanese, Hong Kong Café, Shanghainese, Szechuan and of course Cantonese restaurants, I thought I was well versed in Chinese food. In fact, I proclaimed myself, an expert - VA, the Chinese food expert. 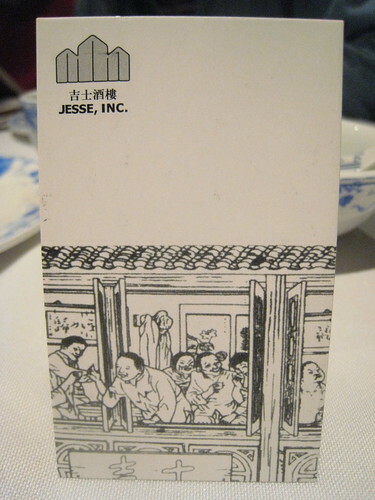 That is until my dinner at Old Jesse, where my expert card was revolted after a Shanghainese dinner with an amazing blend of sweet and savory flavors that was foreign to my palette. . How can I be an expert and have never tasted authentic Shanghainese flavors? In fact, I was always uninspired by the “authentic” Shanghainese cuisine in the states, but it is the real deal at Old Jesse and the real deal was amazing. 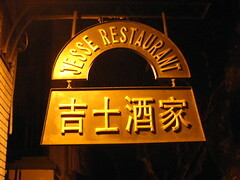 Old Jesse serves traditional food, but it is not located in an old school food stall. Old Jesse is in a small, clean, minimalist, yet warm space located in the outskirts of the French Concession on a quant, quiet street. The restaurant is always busy. Apparently, old money and Chinese A-listers are regular clienteles, but as a tourist, I wouldn’t know one even if they accidentally bumped into me. Reservations are recommended. Be sure to make it a few days ahead of time. Luckily my mandarin-speaking mom called a few days before we arrived in Asia and made a reservation for 7:30 on a Tuesday night for 4 people. Do your homework; the waiter was bad at making recommendations, so I took a mental survey at the other patrons and ordered the most popular dishes that were ordered around me. 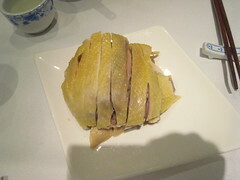 Jishi’s Salted Chicken - Tough and dried with an alcohol taste like a drunken chicken. I was not a fan. 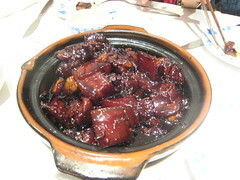 Braised Pork in Brown Sauce - Fatty pork in a sweet, savory, oily sauce. This pork was amazing, except, I had to control myself from eating too much. I could feel my arteries clog up. 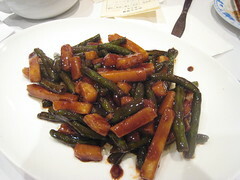 Fried Sword Bean with Potato - (Vegetarian dish) Green beans and potatoes swimming in oil, mixed in the same sauce as the pork. The dish was yummy, but there was too much oil for my taste. 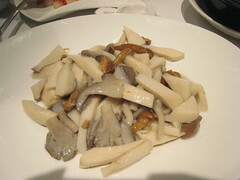 Gluten and Mushroom Pot - Various types of mushrooms sautéed together with oil. I feel like there was a little butter too, but I’m not sure if they use that in Shanghainese cooking. 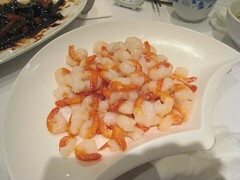 Shaken Shrimp - Mini, fresh peeled, sautéed shrimp. It was tasty. I loved the pork dish the most! It was a great food experience and I enjoyed it. 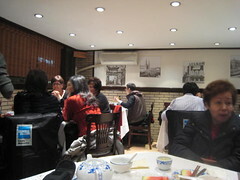 We spent about 300 RMB for the meal. It was well worth the price tag. Shanghainese food in America is watered down for the local plate. 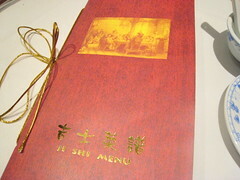 I realized that I am not well versed in Chinese cuisine, like me, the food I eat is Chinese American. Maybe one day, after more time in China, I will be well versed in Chinese food too.